Using the actual number of Preece recorded in the 1881 census is one way of analyzing the population at that time, but it is flawed in that it records all Preece references - including those who started life as Smith, Jones etc. and later married into the Preece name. This section aims to exclude such records, and looks at male Preece records, unmarried females, and of course children. Almost uniquely, Herefordshire shows more people born in the county than living in it, even after adding back the female wives and widows. This reflects the earlier assertion that this county was the main one for Preece at this time, and also the movement away from the county for work, as industrial employment began to expand. Shropshire also shows more people born in the county than in residence, perhaps unsurprising given its border with Herefordshire, and the general movement which had begun towards the growing industrial areas. This is well demonstrated by the details for Yorkshire and Lancashire, where more and more Preece families moved towards the end of the 19th century. Looking at the numbers born in the two counties, a marked increase is seen in residence, particularly Yorkshire, and nearby Cheshire also shows a rise, although more modest. This reflects the growing employment in those areas, and census and other records show many Preece families 'migrating' from Midland counties to those further north at this time. At the other end of the country, the same is true of the two counties making up London, Middlesex and Surrey. 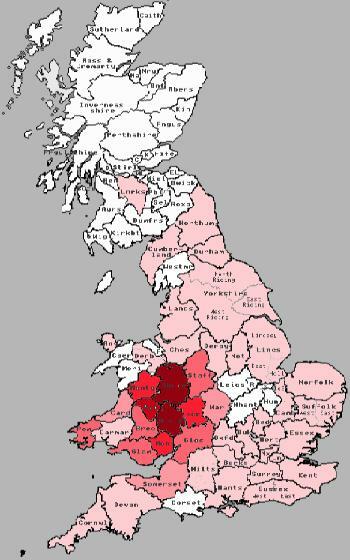 Although Preece families had lived in these counties for many years, and the Preece population of Middlesex was, by this time, greater than any of the Welsh counties. 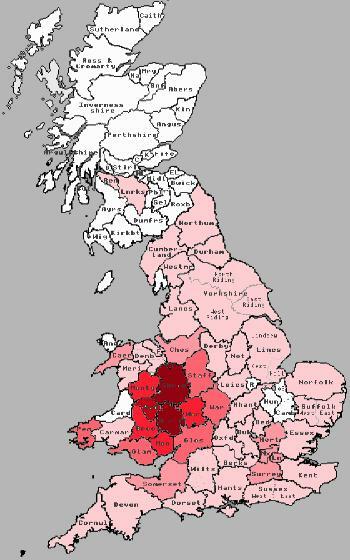 Other reasons, such as the use of Price by many families in Wales, contribute to this, but the fact that London was attracting people from across the country is clear, something which has of course continued to the present day. The cost of living in London has now become prohibitively high to many, and it would be interesting to see migration patterns over the next 100 years. An overall look at the main areas (North East, North West etc. ), comparing 1881 and 1999, has been carried out, and can be viewed by clicking here. This study shows some interesting changes in the geographical make-up of the Preece population.